Ghost Flowers or Indian Pipe taken at Bonaventure Cemetery, Savannah. They dwell aloof, a spotless sisterhood. Their heads are bent, as if in prayerful mood. From spirit-gardens just beyond our ken. Forget the vows made in that cloistered nook. This ode to the Indian Pipe, also known as Corpse plant, Death plant, Ice plant, Ghost flower, Bird’s nest, Fairy smoke, Eyebright, Fit plant and Convulsion root, was penned by Mary Higgenson. The second wife of the noted Massachusetts abolitionist Thomas Wentworth Higgenson, who commanded the first regiment of freed slaves in the Civil War, Mary thought so much of the plant that she wrote the poem “Ghost Flowers” in tribute to their pallid beauty. The generic name for this truly unique plant is Monotropa uniflora. The name comes from the Greek mono meaning one and tropos meaning turning which, according to one interpretation, was assigned to the plant to characterize the initial downward-turning of the flowers that only turn upwards once the seeds are fertilized. Two other interpretations of “one turning” are that the flower has a single turn and that the flowers all turn to one side. The singular flower on each stem is the reason for the species name, uniflora, which is Latin for one flower. Contrasting with the opaline translucence of this ghostly flower is its verdant parent plant family–the Ericaceae, which contains azaleas, rhododendron and blueberries, among others. It is one of some 3,000 species of plants that do not have any chlorophyll and are thus non-photosynthetic and therefore not green. Such plants are called heterotrophs in that, like the animals and the fungi, they must obtain nutrition from a photosynthesizing autotroph. Most heterotrophic plants are parasitic, which means they absorb energy directly from their plant host. What is so unusual about Ghost Flowers is that it is one of about 400 heterotrophs that subsist on a fungus, a relationship that is referred to as mycoheterotrophic or epiparasitic. 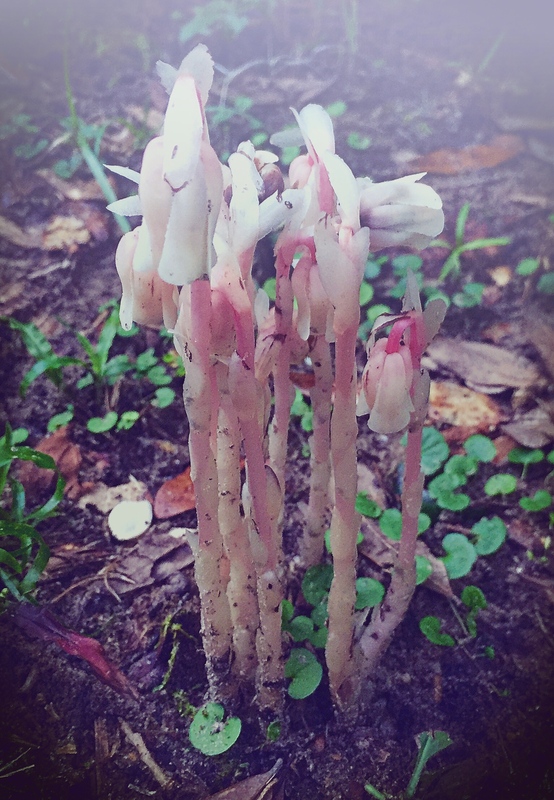 This means that Indian pipe is in a nutritional ménage à trois in that it is connected to a fungus that is in turn in a relationship with a host plant of the Ericaceae family. And this is where the Indian Pipe gets another of its names as the roots of the Indian pipe are intermingled at the cellular level with the hyphae of the fungus so that the appearance is that of a Bird’s Nest. The ethereal appearance of the Indian Pipe with its pallid, bract-covered stem topped by a nodding, equally white flower, makes it one of the most readily identifiable wildflowers. Because of its distiict appearance, it has many metaphorical sobriquets ranging from Death Plant to Fairy Smoke. It is cool to the touch and is sometimes called Ice Plant. Indian Pipe decomposes into a black, gelatinous mass and is accorded that macabre Corpse Plant for this characteristic. Native Americans used its stem juices in the preparation of a treatment for sore or inflamed eyes from whence comes the name Eyebright. They also used it as a topical application for warts and bunions, and to ameliorate general aches and pains. The Colonists adopted these practices, and extended them to the use of the powdered root in the treatment of a variety of ailments, notably Saint Vitus’ Dance or chorea, a nervous condition characterized by irregular, jerking movements. The common names Fit Root and Convulsion Root are vestiges of this practice. Whether you consider them fair or foul, Ghost Flowers can surely be regarded as one of the most unusual species in the forest world.